The Jesuit Sinking of the Titanic to Create the Federal Reserve Corp.
(~ Ed. The Federal Reserve is no more ‘federal’ than Federal Express. It is a privately owned corporation established in 1913 to make money by printing money, at interest, for the U.S. Government and is under control of the Rothschild’s Bank of International Settlements (BIIS), located in Geneva, Switzerland. In 2012 it made $77 Billion in profits alone. Switzerland is home to the Rothschilds, the military that guards the Vatican, the secret bank accounts of the wealthy and a country who was never attacked or invaded during WWI or WWII. Certain conspiracy theorists believe that there was a force behind the sinking of the Titanic. 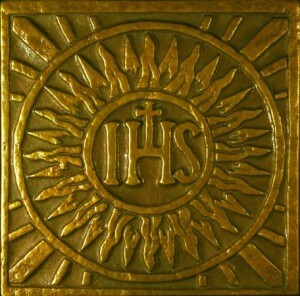 A Catholic order known as the Jesuits compelled to carry out Jesus’ work. In this instance, theorists believe that the establishment of the U.S. Federal Reserve was ushered into being. Those in belief of the theory speak of a group of Illuminati, enlightened individuals with a plan for a New World Order, in which it will be necessary to establish the Federal Reserve. Many are unclear on what exactly the Federal Reserve is. Operated outside of the constraints of the U.S. government, the Federal Reserve has these responsibilities. 1. Conducting the nation’s monetary policy by influencing monetary and credit conditions in the economy in pursuit of maximum employment, stable prices, and moderate long-term interest rates. 2. Supervising and regulating banking institutions to ensure the safety and soundness of the nation’s banking and financial system, and protect the credit rights of consumers. 3. Maintaining stability of the financial system and containing systemic risk that may arise in financial markets. 4. Providing financial services to depository institutions, the U.S. government, and foreign official institutions, including playing a major role in operating the nation’s payments system. 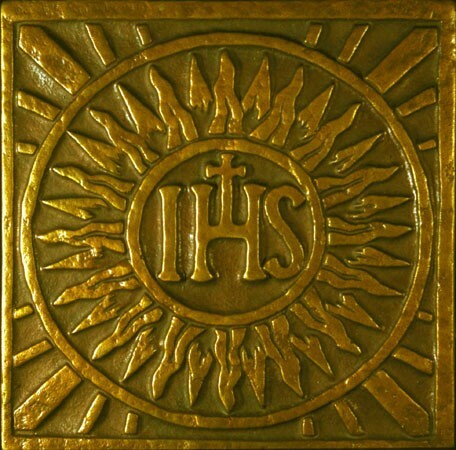 Theorists believe that this Jesuit establishment was created so that the order could loan money, shape the world landscape, and become one of the most powerful organizations in the world. 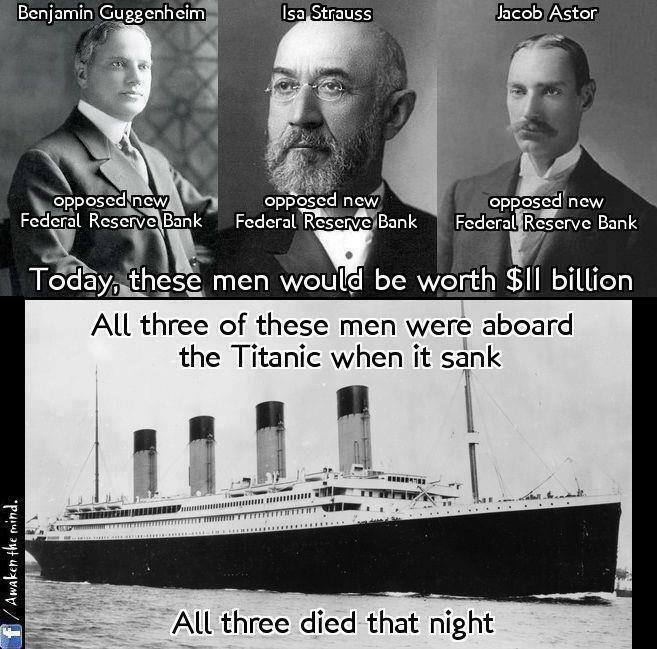 Here’s how the Federal Reserve and the Titanic are connected. In 1910, seven men met on Jekyll island just off the coast of Georgia to plan the Federal Reserve Bank. Nelson Aldrich and Frank Vanderclip represented the Rockefeller (Illuminati) financial empire. Henry Davidson, Charles Norton and Benjamin Strong represented J.P. Morgan (Illuminati). Paul Warburg (Illuminati) represented the Rothschilds (Illuminati) Banking dynasty of Europe. Necessary to their plans, the Federal Reserve did have some opposition; those who saw what the future would become if banking was outside of the government’s hands, the rates set by a private company such as the Fed. All the wealthy and powerful men the Jesuits wanted to get rid of were invited to take the cruise. Three of the richest and most important of these were Benjamin Guggenheim, Isador Strauss, the head of Macy’s Department Stores, and John Jacob Astor, probably the wealthiest man in the world. Their total wealth, at that time, using dollar values of their day was more than 500 million dollars. Today that amount of money would be worth nearly eleven billion dollars. These three men were coaxed and encouraged to board the floating palace. They had to be destroyed because the Jesuits knew they would use their wealth and influence to oppose a Federal Reserve Bank as well as the various wars that were being planned. It can also be mentioned that J.P. Morgan, the individual contracted to build the Titanic was scheduled to be on the maiden voyage, but canceled. When the ship departed southern England, on board was Father Francis Browne. He was the most powerful Jesuit in all of Ireland and the Jesuit Master of Edward Smith. Here is Jesuit treachery at its finest. The provincial Father Francis Browne boards the Titanic, photographs the victims, most assuredly briefs the Captain concerning his oath as a Jesuit, and the following morning bids him farewell. (Eric J. Phelps, Vatican Assassins Halcon Unified Services). Theorists believe that the mysteries surrounding the sinking of the Titanic are simply too coincidental not to be premeditated. Smith, being a mater navigator of the Atlantic, allegedly sailed directly into iceberg territory, failing to heed the numerous warnings given by other ships to decrease speed, and tread carefully. The glancing blow to the side of the Titanic is also said to violate basic safety measurements associated with sailing. Danger is meant to be met head on to avoid exactly what happened to the Titanic.